Haven't posted much here, of late. Been pretty busy. 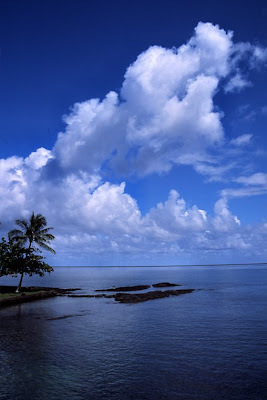 But I was looking through some older work, and ran across this shot of a perfect tropical day in Hilo, Hawaii. When they say blue Hawaii, they aren't kidding. This was shot with a Canon T-90 SLR on Fuji Velvia slide film and using a polarizing filter. I made a few adjustments in Photoshop to match the tones of the slide, so this is pretty much what came right out of the camera. Obviously, I'm a sucker for blue.